The first look at DC’s upcoming animated feature The Death of Superman has been revealed thanks to a preview image featured on the iTunes Extras page for Suicide Squad: Hell to Pay. The animated film which was announced last year at San Diego Comic-Con will follow this April’s Suicide Squad: Hell to Pay. The cast, as well as an official synopsis, have yet to be revealed, however, The Death of Superman will be the first of a two-parter adapting DC’s iconic story of Superman’s fatal battle with Doomsday. The film is said to be a longer and more faithful adaptation of the storyline than 2007’s Superman: Doomsday. It will be followed in 2019 by Reign of the Supermen, which has been teased to feature Superman alternates such as Steel, Cyborg Superman, Superboy and the Last Son of Krypton. Voice Cast: Jerry O’Connell (Billions) will return to voice Superman for the fourth time. O’Connell’s wife Rebecca Romijn (The Librarians, X-Men) will voice Superman’s wife Lois Lane. Rainn Wilson (The Office, Star Trek: Discovery) will play the villain Lex Luthor. Jane the Virgin’s Rosario Dawson as Wonder Woman; Castle and Firefly alum Nathan Fillion as Green Lantern; Covert Affairs’ Christopher Gorham as The Flash; Timeless’ Matt Lanter as Aquaman; Shemar Moore from SWAT as Cyborg; and Jason O’Mara, who played The Patriot in Agents of SHIELD, returning as Batman and Rocky Carroll of NCIS will play Cyborg’s father. Patrick Fabian from Better Call Saul will voice Hank Henshaw. 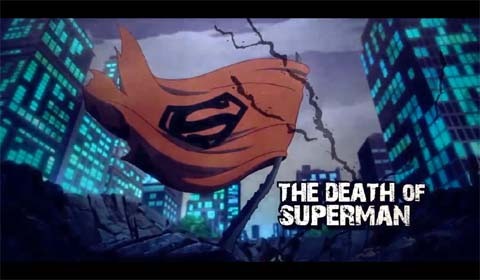 You can check out the first look at The Death of Superman below.